T-Mobile in line to get HTC Incredible? 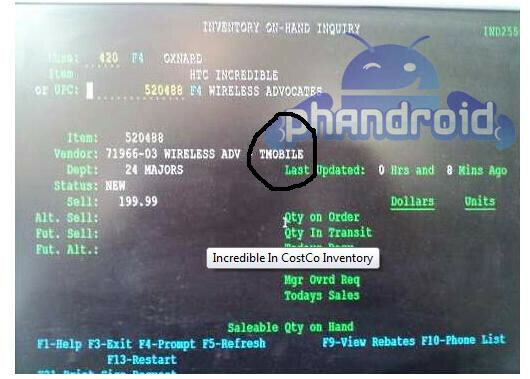 One of the forum members at Phandroid managed to sneak a peek at the internal systems for Costco and came away with some surprising info. Sure, it might not be too much of a shocker to see that the HTC Incredible will be offered for $199.99 with a 2 year contract. The surprising thing is that the vendor is listed as T-Mobile, not Verizon. We have seen Big Red gearing up for its launch of the highly spec'd Android monster, but a GSM variant getting released by T-Mobile has not even been quietly whispered about-until now. If Costco's computer guys didn't make a mistake, this news would be considered-ahem-Incredible. Rock & Roll! I'm glad to see the TMO'rs getting this. I'm on VZW and together well give this handset the audience it deserves. ...T-MO "MIGHT" be getting. I hope they do too but this is not confirmed it's just a possibility. Don't get excited yet...we see how rumors turn out on this site lol. I am betting that's a mistake. Why would they have Tmo listed and not Verizon when we know it is coming to Verizon. its not coming to verizon, ive been following this phone very closely. it has something to do with the company that will provide costco with the phones. id be assuming,but im pretty sure that thecompany thats sending phones to costco would be HTC since they make the phone :) Its going to VZW, thats been confirmed 100x over. Id be extatic if this hopped to Tmobile. It would make sence. Tmobile has a very cozy relationship with HTC which is why we get so many of their phones. Hey, we shared the nexus, u share the incredible. Were all happy :) (especially when i buy it if it does..LOL) This is gonna kill any hype of the nexus on VZW though. Why get a nexus when u can get an incredible which is the same thing but with sence and a huge camera?